Plenty… that is, if you love the rural beauty of the area and the ability to buy fresh, local food from small family farms, a growing number of which are choosing to farm sustainably or even organically (as in USDA certified organic). As you may already know, the rather colossal piece of legislation referred to as the “Farm Bill” governs nearly everything about the food we eat and the land on which that food is grown. The bill has been blamed for much of what is wrong with our food system and may hold the keys to creating a better system for us, our farmers and our land. Reauthorized every five years, the bill currently is making its way through Congress, absorbing pressure from lobbyists and activists along the way. Things are likely to heat up this summer (excuse the pun) as the bill moves toward a final vote, ideally before the current version expires on September 30. No one expects the 2012 bill to be perfect, but food activists, environmentalists and others continue to push for goals including increased support for small, organic and sustainable farming and adequate funding for nutrition and conservation programs. While the sausage-making process continues, there is still time to get involved and make your voice heard. Following are some basics about the bill and a list of resources that can make it quick and easy to take a stand. First passed in 1933 as the Agricultural Adjustment Act, the bill was designed to help farmers survive the Great Depression. Many experts and historians would say it was successful at achieving that goal. The bill has evolved a great deal over the years in response to changes in the economy and agriculture and pressure from a wide range of interested parties. Today, it allocates about $100 billion a year for farm subsidies and crop insurance; soil and land conservation; trade; nutrition programs, including school lunches, foreign aid and SNAP (the Supplemental Nutrition Assistance Program, formerly known as “food stamps”); rural development; agricultural research; forestry; and biofuel development. Our own area benefits from the Farm and Ranch Lands Protection Program as well as the Wetlands Reserve, Wildlife Habitat Incentive and Environmental Quality Incentive programs, which support farmland preservation and conservation as well as helping farmers make the switch to organic methods. The lion’s share of farm bill subsidies goes to a small percentage of large-scale “industrial” farms that grow the nation’s major commodity crops (corn, wheat, cotton, soybeans and rice), rather than to small, independently owned farms more inclined to grow diverse crops, including fruits and vegetables. Subsidizing commodities keeps prices low, which has repercussions globally and domestically. For example, our cheap subsidized corn makes it harder for farmers in developing nations to compete in the world market. That can push them out of business, leading to poverty and food insecurity that we then address with food aid paid for by the farm bill. Domestically, low prices for corn (just to take one example) make that commodity attractive as feed for livestock and as a raw material for food additives, including the now infamous high-fructose corn syrup. We end up with a lot of corn in our diet, unintentionally, a phenomenon that has been linked to obesity. The subsidies also encourage farming practices that may endanger the land, the water supply and, ultimately, our health. Those practices include mono-crop farming (growing lots of just one crop), heavy use of chemical “inputs” (fertilizers and pesticides), the use of genetically modified seeds (GMOs) and heavy reliance on antibiotics and hormones in raising livestock. 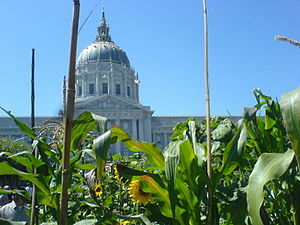 The 2012 bill acutally may increase subsidies to “Big Ag” while taking money away from conservation programs and SNAP. Shift financial support away from highly profitable industrial farms and to the independent family farms and start-ups that actually need a safety net. Provide greater support for sustainable agriculture, with its focus on diverse crops, and for organic farmers and those who want to transition to organic methods. Support farm-to-school programs to ensure children have access to healthy food at school. Provide robust support for SNAP, which is seeing increased demand because of the economy, and for soil and water conservation programs. The Environmental Working Group, www.ewg.org. Northeast Organic Farming Association: NOFA NJ, www.nofanj.org; NOFA PA, www.nofapa.org. You also may want to check out “What Is the Farm Bill” a report written by Renee Johnson in 2010 for the Congressional Research Service. It’s a surprisingly easy read!